1Click the Page Break Preview button (the third one in the cluster of three to the left of the Zoom slider) on the status bar, or choose View→Page Break Preview on the Ribbon, or press Alt+WI. 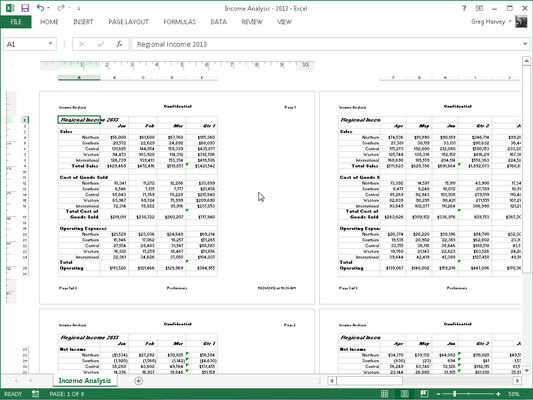 This takes you into a Page Break Preview mode that shows your worksheet data at a reduced magnification (60 percent of normal) with the page numbers displayed in large, light type and the page breaks shown by heavy lines between the columns and rows of the worksheet. Here is a worksheet in Page Break Preview with an example of a bad vertical and horizontal page break that you can remedy by adjusting the location of the page break on Pages 1 and 3. 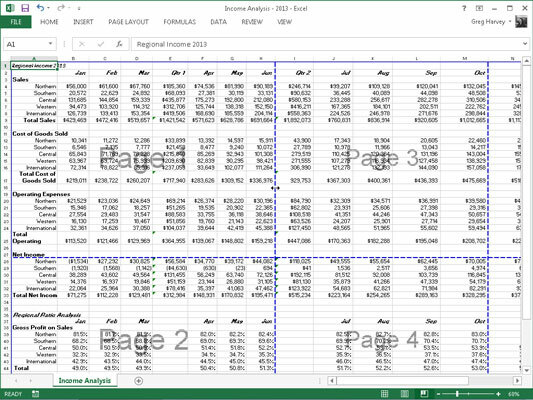 Given the page size, orientation, and margin settings for this report, Excel inserts a vertical page break between columns H and I. This break separates the April, May, and June sales on Page 1 from the Qtr 2 subtotals on Page 3. 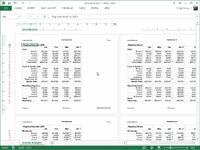 It also inserts a horizontal page break between rows 27 and 28, splitting the Net Income heading from its data in the rows below. 2Position the mouse or Touch pointer somewhere on the page break indicator (one of the heavy lines surrounding the representation of the page) that you need to adjust; when the pointer changes to a double-headed arrow, drag the page indicator to the desired column or row and release the mouse button. For the example shown drag the page break indicator between Pages 1 and 3 to the left so that it’s between columns E and F and the page indicator between Page 1 and 2 up so that its between row 26 and 27. You can see Page 1 of the report as it then appears in the Print Preview window. 3After you finish adjusting the page breaks in Page Break Preview (and, presumably, printing the report), click the Normal button (the first one in the cluster of three to the left of the Zoom slider) on the status bar. 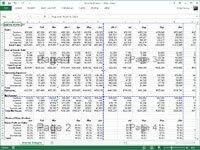 Or you can choose View→Normal on the Ribbon, or press Alt+WL to return the worksheet to its regular view of the data. You can also insert your own manual page breaks at the cell cursor’s position by choosing Insert Page Break from the Breaks button’s drop-down menu on the Page Layout tab (Alt+PBI), and you can remove them by choosing Remove Page Break from this menu (Alt+PBR). To remove all manual page breaks that you’ve inserted into a report, choose Reset All Page Breaks from the Breaks button’s drop-down menu (Alt+PBA).